Ford Motor Co. in Dearborn will host a 10-day Winter Festival in front of its recently purchased Michigan Central Station in Corktown starting Friday, Jan. 18. The festival, which is an extension of Ford’s North American International Auto Show presence, will run through Sunday, Jan. 27 and include a 3-D light show projected onto the 18-story building, a market, a first-of-its-kind exhibition of train station artifacts, and activities. 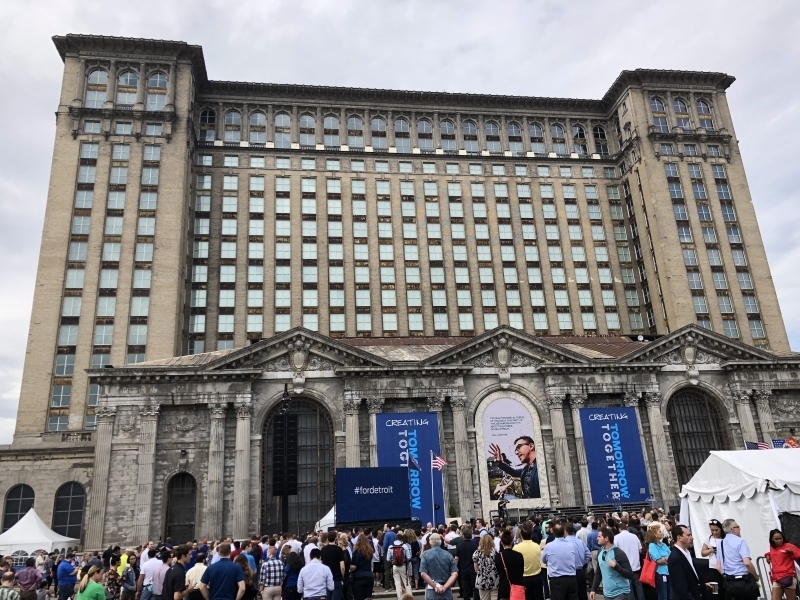 The light show will tell the story of the station and highlight Ford’s plans for the soon-to-be 1.2-million-square-foot innovation campus. The show will play three times per hour. Intervals will be filled with projections from local artists and live music from Detroit-area DJs and musicians. The exhibition of artifacts will be curated by the Detroit Historical Society. The evenings will also include graffiti painting; live performances; s’mores; food trucks; beverage stations; ice carving; vendor booths featuring artists, shops, and community organizations; and activities for children. The event will take place 5:30-10 p.m. on Fridays, Saturdays, and Sunday, Jan. 20, and 5:30-9 p.m. Monday-Thursday and Sunday, Jan. 27. Michigan Central Station is located at 2001 15th St. in Detroit’s Corktown neighborhood. There is no cost to attend. Limited parking will be available onsite. Shuttle location and information will be announced shortly. More information is available here. Construction on the station is underway, so the event will be outside.